The hilly regions of India become popular tourist destinations during the summer season and they also come alive with an array of delicious wild fruits. Kafal, kingod, karonda and hisar are well-known mouth-watering edible fruits of the season. A lesser-known fruit is chulu, which has multiple uses. Villagers in Uttarakhand and Himachal Pradesh grow chulu or apricot (Prunus armeniaca) in their home gardens. It is a medium sized tree, which begins flowering in March. The chulu tree bears white/ pinkish flowers before sprouting new leaves during spring. So the tree is adorned with flowers without leaves and one can hear bees buzzing around the flowers throughout the day. The flowering of chulu coincides with a local festival in Garhwal called Fuldeyi. It is a children’s festival and kids can be seen collecting flowers in the morning, which they place at the doorstep of every household in the village. In return, they receive some gifts from every household. This festival is still celebrated during chaitra, the first month in the Hindu calender (usually April). The fruits begin to ripen during the peak summer months of May and June. The period for maturity of fruits depends on altitude and location. At lower altitudes, chulu matures early. The green fruits ripen gradually, from yellow to orange, and the sour taste changes to sweet. The fruits are harvested manually, by plucking or shaking the twigs. I remember our village elders used to discourage us to consume the sun exposed fruits, as they consider such fruits not good for digestion and overall health. The fruits are usually harvested in the morning and are used for multiple purposes. The fleshy outer parts of the fruits are eaten raw or with salt (which is prepared by mixing green chilies and garlic). The half-ripened fruits are used to make a chutney (see recipe). 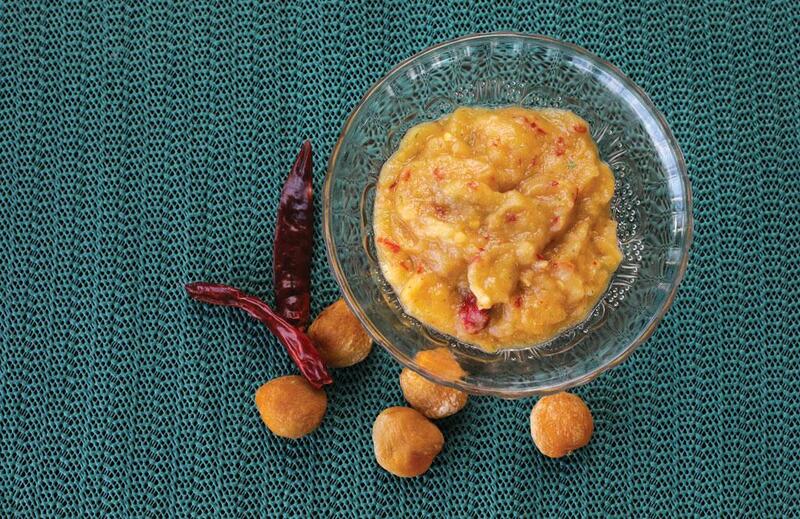 The chutney can induce appetite as well as enhance the taste of regular food. Since the fresh fruits are seasonal, and as fresh fruits become surplus due to ripening within a short period of time during the season, the local people of Garhwal segregate the fleshy part or pulp and dry it in the sun or shade. It is stored for several months and used to make chutney when required. A small quantity of dried pulp is also mixed in many local food preparations to enhance their taste. Chulu seeds are equally important, as they are a storehouse of medicinal properties. They have both a bitter and sweet taste. Sweet seeds taste like almonds. The droplet-shaped reddish-brown seeds, once sun-dried, are pressed to extract oil that is traditionally used to treat body ache and joint pains. Chulu oil is, in fact, sold in Ayurvedic shops. “The villagers of Tehri and Uttarkashi districts use chulu oil to treat migraine,” says Asharam Bangwal of Purola, Uttarkashi. Since the hills of Uttarakhand are snow capped for most parts of the year, chulu oil brings relief during the cold months. Chulu can be grown in almost all soils. In the initial years, pruning is not required. Once it grows older, the excess growth of the branches can be pruned for better growth. The tree begins to bear fruits after 4-5 years and can provide about 70 kg fruits per year. Chulu is also grown in other parts of the world. Turkey, Greece, Spain, Italy, USA and France are the major producers of chulu fruits. In India, it grows in the temperate zones of Uttarakhand, Himachal Pradesh and Jammu and Kashmir, between the elevation range of 1,200-2,500 m above sea level. The fruits are rich in vitamin A and C, calcium, iron and phosphorus. A study by D Yiğit published in Brazilian Journal of Medical and Biological Research says chulu seeds have antibacterial properties. Despite having a number of nutritional and medicinal properties, there have been little efforts to commercialise its cultivation. In fact, there has been a decline in the cultivation of chulu, observes C P Kuniyal, a scientist with the Herbal Research and Development Institute, Gopeshwar. While working with the National Medicinal Plants Board in New Delhi, I once happened to meet Chandi Prasad Bhatt, the noted leader of the Chipko movement and environmentalist. He was very keen to encourage chulu plantation in Garhwal. “Planting chulu will provide not only livelihood to the local people, but it will also help improve people’s health as it has numerous medicinal properties,” he said. Method Finely grind all the ingredients. In case the pulp is dried, add 3-4 spoons of water during grinding.